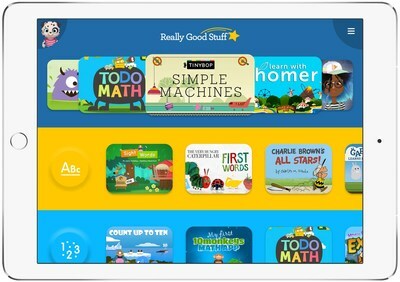 SHELTON, Conn., Sept. 24, 2018 /PRNewswire/ -- Really Good Stuff, a leading provider of educational tools and solutions for elementary school teachers, is turning the back-to-school blues into a celebration with the launch of Really Good Stuff Digital Learning Collection. Who says classwork can't be fun? Digital Learning Collection puts kids at the center of learning fun and brings engaging digital content to supplement K-2nd grade curriculum with 150+ activities from some of the most popular children's brands and the best educational developers, from Tinybop, Dr. Panda and Edoki Academy to THUP Games and Highlights for Children all mapped to National, State and Common Core Standards. Teachers can learn more and sign-up for a free 30-day trial today at www.reallygoodstuffdigital.com. Created for K-2 teachers, this precedent-setting all-in-one digital supplemental learning collection features games, books, puzzles, coding activities, downloadable content and more that support learning across seven subjects including math, language arts, STEM, science, critical thinking and social emotional learning. Leveraging an innovative new technology platform developed in partnership with the digital learning team at Fingerprint, teachers can easily assign developmental 'play time' with digital activities to the entire class or to meet the needs of individual students who might need to dedicate extra time to reading comprehension or practice with a new math concept. Teachers can also use the digital learning solution for inspiration and as a part of education-focused events like STEM Day and other learning 'holidays' where they can dedicate more time to one subject or a theme. "We value our relationship with teachers and their feedback has been the guiding voice in every aspect of creating Really Good Stuff Digital Learning Collection," said Anupam Martins, President of Really Good Stuff, an Excelligence Learning Corporation company. "Classrooms are being transformed with digital screens and our aim with Digital Learning Collection is to engage children in the fun of learning and to make teacher's lives easier by offering them a one-stop digital resource for the best learning content that kids love all in one place." Teachers need every minute in the classroom to count and they asked for content that gets kids engaged and inspires a love of learning while aligning with standards. Really Good Stuff partnered with the digital curriculum experts at Fingerprint to deliver a custom collection of the very best kids-branded content from the top educational developers from around the world. The company brought together brands that kids love and that teachers can trust and mapped every activity to standards ensuring that when a teacher assigns an activity to a student, they know it will deliver equal parts education and entertainment. Really Good Stuff Digital Learning Collection is an educational service for the classroom, which includes a web-based Teacher Center and a Student Application available now on the Apple App Store and the Google Play store. It has been certified by kidSAFE for adhering to strict standards for online safety and privacy compliance; and is available now. To sign up for a free 30-day trial or to get more information about the service, visit www.reallygoodstuffdigital.com. Founded in 1992, Really Good Stuff is one of the most trusted brands in education. The company works side-by-side with educators to create high quality and affordable products that provide teachers, primarily in grades K-8, with innovative solutions designed to make a difference in students' lives. Today, through its catalogs and website, the company offers more than 7,500 items, including classroom organization solutions such as bins, baskets and bookcases to fun educational activities in the language arts, numeracy and STEM, including Steve Spangler Science and Steve Spangler Science Club products; introducing well over 1,000 new products annually. For more information on Really Good Stuff, visit www.reallygoodstuff.com and stay up to date on the latest news from the company on Facebook, Instagram, Twitter, Pinterest and YouTube. Fingerprint is a leading global provider of digital content for kids and families. The San Francisco-based mobile technology company creates custom kids' learning platforms and curates content for customers around the world. Industry leaders in technology, edutainment, broadcast and more license Fingerprint's technology platform and use their content solutions to serve up customized branded mobile networks that help them better connect with mobile families in a kid-safe and meaningful way. Fingerprint is funded by leading media and technology investors including Corus Entertainment, DreamWorks Animation, Reed Elsevier Ventures, Trinity Capital Investment and GSV. Excelligence Learning Corporation is a leading developer, manufacturer, distributor, and multi-channel retailer of over 20,000 innovative, high-quality and grade-appropriate educational products and teaching solutions, which are sold primarily to early childhood learning centers, elementary schools, PTAs, and consumers. The company has three core divisions: Supplies (Discount School Supply, and Really Good Stuff), Equipment (Children's Factory, Angeles, Steffy Wood Products and Learning Carpets), and Services (Educational Products, Inc., ChildCare Education Institute, Frog Street Press, and LifeCubby). With over 30 years of experience serving children, educators and parents, Excelligence's diversified portfolio of leading brands delivers quality, innovation, service and value on a global scale. Leading proprietary brands include: Colorations®, BioColor®, Excellerations®, MyPerfectClassroom®, Environments®, and Steve Spangler Science™.